Jeep initially planned to introduce the redesigned Grand Cherokee (shown) in Europe in the third quarter. DETROIT – The new Jeep Grand Cherokee's European debut will be delayed due to strong U.S. demand for the redesigned SUV. Industry sources say that gasoline versions of the Grand Cherokee will arrive in the fourth quarter of 2010 and that diesel variants, which are expected to be the model line's top sellers, won't debut until the second quarter of 2011. Jeep started making right-hand-drive Grand Cherokee models for export to Europe at its plant here in Detroit on July 12. But shipments of those models are likely to be stalled to cope with high number of Cherokee orders in North America. Jeep initially planned to introduce the redesigned Grand Cherokee in Europe in the third quarter. And the Detroit plant was scheduled to begin building a diesel version for Europe in the first quarter of 2011. To keep up with demand, Chrysler Group may add a third production shift, says a person familiar with the automaker's plans. Chrysler just hired 1,080 workers to staff a second shift, which began July 19. 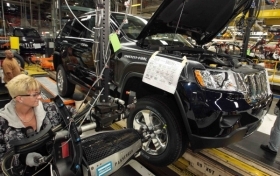 The plant is the only source of Grand Cherokee output and now employs 2,837 workers. "Orders continue being much higher than initial expectations, and we are considering adding a third shift soon," the person said. A Chrysler spokeswoman, Jodi Tinson, declined to comment. The European version of the new Grand Cherokee will be available with a 225-hp 3.0-liter V-6 diesel produced by VM Motori in Cento, Italy. The engine will undergo emissions and performance tests in September, a VM Motori spokesman said. The current Grand Cherokee has a 218-hp 3.0-liter Mercedes-Benz V-6 from Chysler's former owner, Daimler AG. VM Motori already supplies Chrysler with the inline four-cylinder 2.8-liter diesel used on European versions of the Cherokee and Jeep Wrangler as well as the Chrysler Voyager and Dodge Nitro. Jeep has no immediate plans to sell a diesel version of the 2011 Grand Cherokee in North America. At issue is how many U.S. buyers will accept the price for the engine and the system for the urea aftertreatment. The urea system is required to meet emissions standards in 50 U.S. states. Some urea-system diesels have a price premium of up to $4,000. Jeep offered the Mercedes diesel as an option on the 2009 Grand Cherokee. The standard engine was a 3.7-liter V-6 gasoline. Jeep is not offering the diesel in the 2010 model. Chrysler began producing the latest Grand Cherokee in May. With the addition of the second shift, Jeep is scheduled to build 136,000 Grand Cherokees this year, up from 60,640 last year. Jeep sold 4,469 Grand Cherokees in Europe in 2009, down 49 percent from the previous year, according to JATO Dynamics. The previous-generation Grand Cherokee was built in Graz, Austria by Magna Steyr, a subsidiary of Canadian group Magna International Inc. The Detroit plant will supply all European versions of the Grand Cherokee. A total of 50,328 Grand Cherokees were sold in the United States in 2009, down 32 percent from the previous year. U.S. and European sales have declined along with an overall dip in demand for SUVs. Chrysler will begin building a vehicle for its Dodge division at the Detroit factory in the fourth quarter. The vehicle will have a longer wheelbase and seven seats and will replace the Durango SUV in the Dodge lineup. The Grand Cherokee has five seats. There are no plans to offer the seven-seat Dodge model in Europe. Chrysler has spent $686 million on the Grand Cherokee program, including a new body shop at the Detroit plant. The revamped body shop is able to handle four body styles, although there are no plans to add a third or fourth vehicle after the introduction of the Durango replacement. Although the Grand Cherokee program was already in the works when Fiat S.p.A. took management control of Chrysler in 2009, the Italian automaker already has brought major changes to Chrysler's manufacturing culture. Employees at the plant have received 44,000 hours of training in Chrysler's latest manufacturing process, developed by Fiat as a version of Toyota's lean manufacturing system. Under the manufacturing blueprint's philosophy of continuous improvement, plant workers already have contributed 2,500 ideas to improve processes, the company said. The Detroit plant, on Jefferson Avenue, opened in 1991 to build the first generation of the Grand Cherokee, introduced in 1992. The plant has built 4.1 million Grand Cherokee models over four generations. Bradford Wernle contributed to this report.